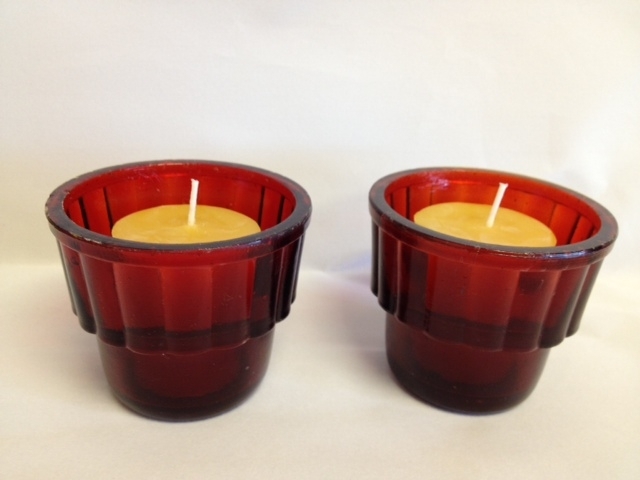 Red Ridged Votive Holders pictured with our Besswax Votive candles, sold separately. Votive glasses are sold individually. Sold individually, these free standing votive candle holders add just the right touch of light to any room. The red glass gives a pleasant glow, and the generous size of the votive holders allows them to accommodate a range of oil or candle sizes. Available in two sizes. The larger votive glass measures 3 inches in height, with a top opening of 3 3/4 inches. The bottom diameter measures 2 1/2 inches and the interior diameter is approximately 2 inches across. The smaller votive glass measures 2 5/8 inches in height, with a top opening of 3 1/4 inches. The bottom diameter measures 2 1/4 inches and the interior diameter is approximately 1 5/8 inches across. Please select the size you wish to order using the check boxes provided.